Now, I can't give you a diagnosis over the internet but I can give you my thoughts. 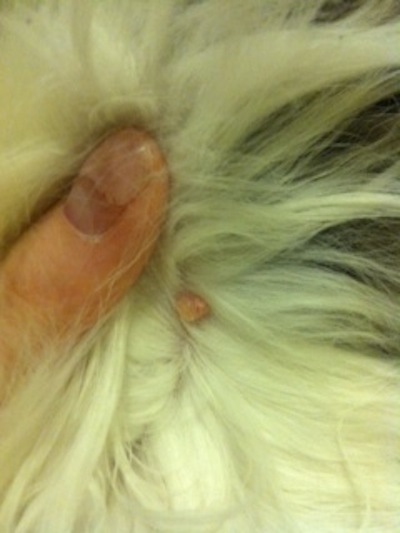 The most likely explanation for this is that it is a wart and nothing to get concerned over. We don't really know why cats get warts. I don't get concerned about them unless they are bothersome to the cat. However, there is always a small chance that this is something else such as a mast cell tumor or a similar type of cancer. From the photo I would say that I am 95% sure it is nothing to be concerned about. If this were my patient I would probably recommend that the next time you were in my office we do some tests on it. The tests would be to put a small needle into it and pull some cells out to look at under the microscope just to make sure it is not something serious. I wouldn't rush in to the vet right now to have it tested, but I would want to test it if it is getting significantly bigger or if it becomes red and swollen or itchy at all.